PT Sarihusada Generasi Mahardika - SGM or referred to as "Sarihusada" is a well-established company in Indonesia which conduct business activity in the field of food and nutrition industry. Sarihusada is a producers of baby and nutritious foods products. Sarihusada was first established in 1954 as NV Saridele. The Company was formed to assist the adequacy of protein in Indonesia and initiated by the Indonesian Government and the United Nations (UN). Later in 1972, the Company renamed into PT Sari Husada. The name of PT Sarihusada Generasi Mahardika officially established in 2012. Sarihusada is a member of Danone Early Life Nutrition and a local units of French-based Danone Group, one of the largest food and beverage companies in the world. 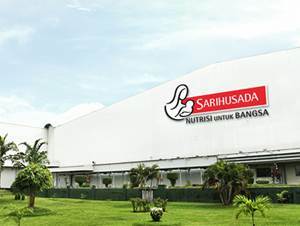 According to Sarihusada's company profile as cited by JobsCDC.com, Sarihusada now has 2 production factories, located at Yogyakarta and Kemudo Prambanan, Klaten Central Java. As a part of Danone Early Life Nutrition, Sarihusada also supported by 3 international research centers and a local research centers in Yogyakarta. Sari Husada operates under quality management system, food safety management system and safety management system based on international standards of ISO 9001, ISO 22000 and OHSAS 18001. D3 Agroindustri / Chemical Engineering. Minimum 1 year of experience in the related field. Strong knowledge of food safety / food process. A fast learner and willing to learn something new. Willing to be placed in SGM Jogja Plant Kusumanegara. Status as contract employee (1 year contract) and have the possibility to become permanent employee. S1 in Food Technology or Pharmacy. Minimum 2 years of experience in Supervisor level, preferably from food or beverages industries. Have a strong knowledge in Quality and Food Safety System, GMP, HACCP. Strong analytical, time management and communications skills. Proficient in reporting with Power Point and Excel. Enthusiast, a fast learner and willing to learn something new. Willing to work in shift. D3 Engineering, preferably with 1 year of experience. Strong interest in administrative work. Strong knowledge in the field of machinery and buildings. Strong knowledge in the field of administrative. Strong knowledge in the field of training / HR training. Willing to work in internship positions. Willing to be placed in the Plant Kusumanegara. JobsCDC.com now available on android device. Download now on Google Play here. Please be aware of recruitment fraud. The entire stage of this selection process is free of charge. PT Sarihusada Generasi Mahardika - D3, S1 Fresh Graduate, Experienced SGM Danone Group September 2016 will never ask for fees or upfront payments for any purposes during the recruitment process such as transportation and accommodation.